Fantastic yellow plush version of Yoshi! The Super Mario Bros.' trusty steed measures 6-inches tall in plush form. Get yourself all of the different-colored Yoshi plush! One of the most recognizable characters from the Mario series by Nintendo comes to you in a variant yellow version as an adorable plush! 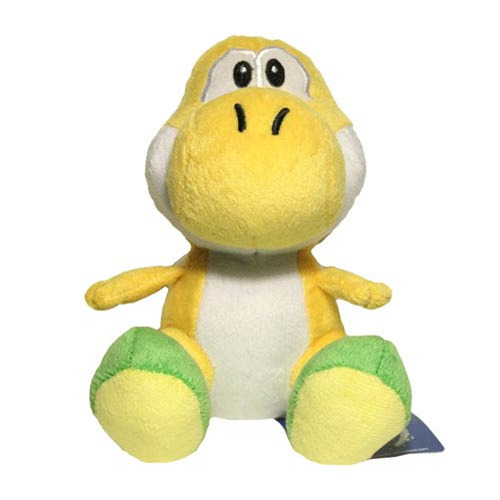 This Super Mario Bros. Yellow Yoshi 6-Inch Plush makes for one incredibly adorable and huggably soft companion that you will not want to do without. But you don't have to go without Yellow Yoshi because this great plush is the perfect size for you to take with you wherever you go! Measures 6-inches tall. Ages 7 and up.